Published on Monday, March 15, 2010. This article appears in the April/May 2010 issue of American Craft Magazine. 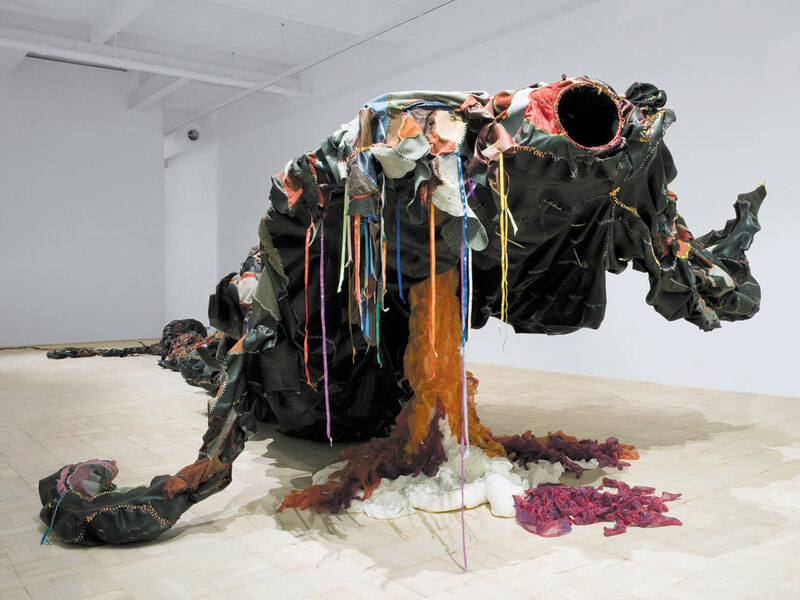 Nicholas Hlbo, Ingubo Yesizwe, 2008, leather, rubber, gauze, ribbon, steel, found ball-and-chair leg, butcher's hook, chain, 8.5 x 5 x 98 ft.
To visit Cape Town is to be transported to a world of great natural beauty and a complex history. Situated on the southern tip of the African continent on the shore of Table Bay, Cape Town is the second-most populous city in South Africa, the largest in land area, and one of the most multiracial and multicultural places on earth. The Cape region’s indigenous peoples were joined by Europeans as long ago as 1652, when the Dutch established a settlement there, which soon drew other immigrants from Europe and (some involuntarily) from other parts of Africa and Asia, and the hub of a colony was born. 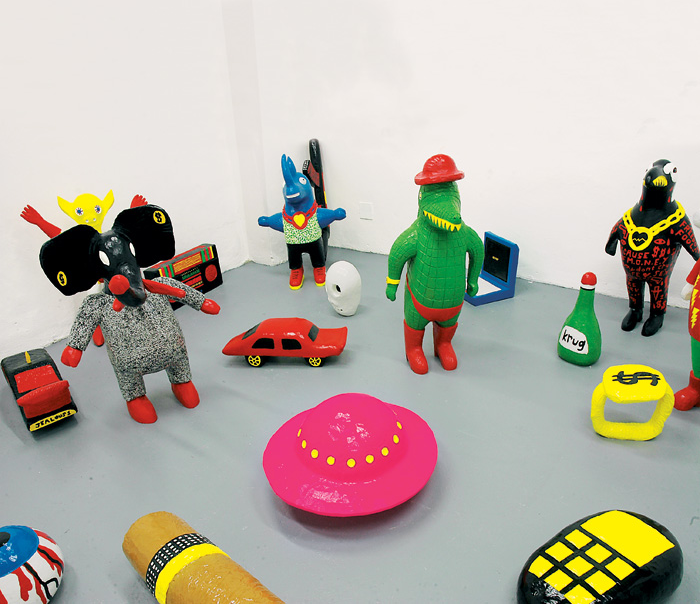 The cultural diversity of Cape Town is reflected in the craft and art that can be found there, some of it unique to this part of the world. The natural amphitheater-shaped area below Table Mountain, known as the City Bowl, has extraordinary galleries, craft markets and museums that embrace Cape Town's eclectic heritage. The Iziko South African National Gallery houses a splendid collection of South African, African, British, French, Dutch and Flemish art providing insight into the range of aesthetic production in the country over the centuries. Of particular importance is the museum’s collection of South African beadwork. 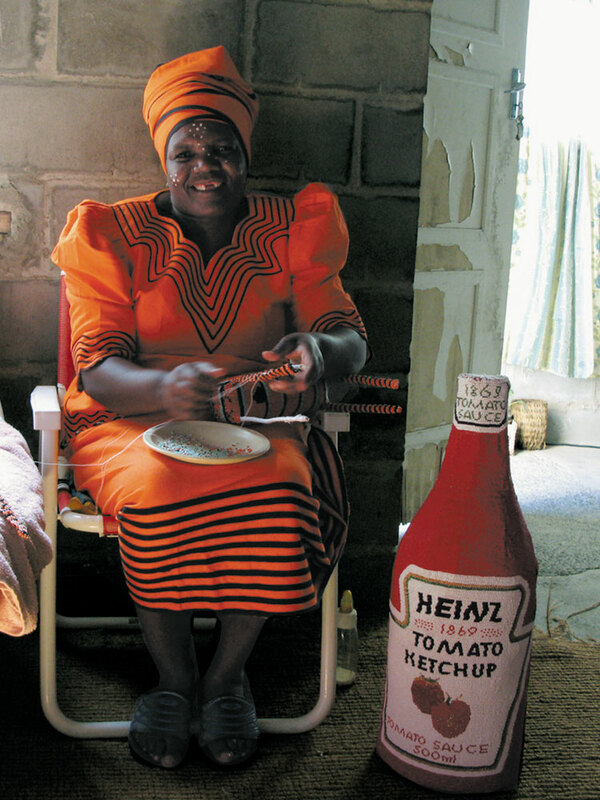 This craft is culturally significant since it was traditionally a form of creative expression for women predominantly from the Xhosa and Zulu tribes. Today it has blossomed into a varied and fascinating craft form. Barbara Jackson and Shirley Fintz have found another way to embrace South Africa's eclectic heritage. In 2000 the two artists founded the cultural empowerment project Monkeybiz, with the goal to alleviate poverty in the Cape townships (areas that had grown up under apartheid) and transfer skills to uneducated and unemployed women. 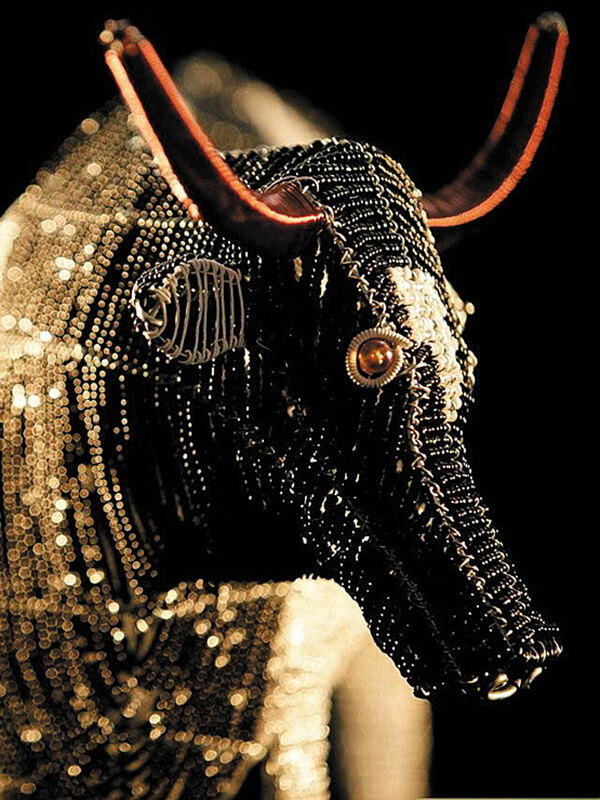 The women create magical sculptural animals inspired by the wildlife of southern Africa—brightly patterned elephants, antelopes and rhinoceroses that elicit smiles at the playful ingenuity of the work.“Monkeybiz has improved the quality of life for these women,” says Joan Krupp, who manages the Monkeybiz retail store. “They have food on their tables and are able to send their children to school." The project has been enormously successful, with a global reach and distribution supporting over 450 women living in the impoverished townships of the region. “The art of beadwork had died due to apartheid,” says Krupp. “Monkeybiz revived this form in a contemporary, quirky medium.” In addition to keeping alive the ancient traditions of beading, Monkeybiz also has an active AIDS and HIV Awareness program designed to educate and assist with medical care and preventive measures, along with providing the artists with access to necessary medications. A visit to the Cape Quarter would not be complete without spending time in Africa Nova, a lovely gallery housing an eclectic collection of fine jewelry, artworks, ceramics, textiles and crafts, all effectively curated within the split-level space. Woodstock, the oldest suburb in the City Bowl, was recently designated one of the city's improvement projects, and as a result is an emerging and creative hub with several new prestigious galleries, a host of cafés and restaurants and an extremely popular Saturday farmers market. The most notable galleries to visit are Michael Stevenson, considered the leading contemporary art gallery in the country, and, next door, Linda Goodman Gallery, another venerable space representing established South African artists such as William Kentridge, David Goldblatt and Sam Nlengethwa. To discover a new generation, one should look into Whatiftheworld Gallery, selected by Contemporary Magazine (London) as one of the “Top 50 Emerging Galleries from Around the World” in 2007. “We are committed to nurturing our artists and working closely with them on a curatorial level,” says director Justin Rhodes, on why the gallery has been a success.” Even though we work with younger artists, we place a strong focus on presenting the works with a very high production level." 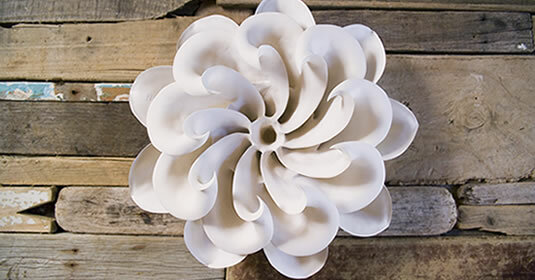 In among the fine arts venues of Woodstock is a vibrant and active craft community. The ceramics studio of Andile Dyalvane, a rising young talent, is located in one of the neighborhood's most exciting commercial spaces, the Old Biscuit Mill. Dyalvane's work, a skillful mingling of ancient traditional codes and modern expressions, has been acknowledged through various national awards. Born into a pastoral Xhosa family, he has actively challenged himself to bridge his different worlds-the rural, traditional value system that is an important part of his heritage, and the urban city life he experiences on a daily basis. The results, soulful and expressive, are beautifully proportioned ceramic vessels, often marked with a razor blade or found tools, tattooed symbols of primordial culture and tribal scarification. To fully experience the inspired craft of the Cape, a drive should be planned to the fishing village Kalk Bay, about an hour's drive from the city center, where a remarkable group of South Africa's ceramic artists reside. 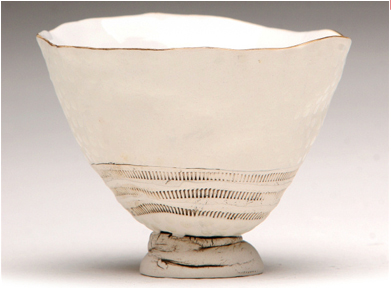 Katherine Glenday, an influential artist, began as a painter but then decided on porcelain as her medium. 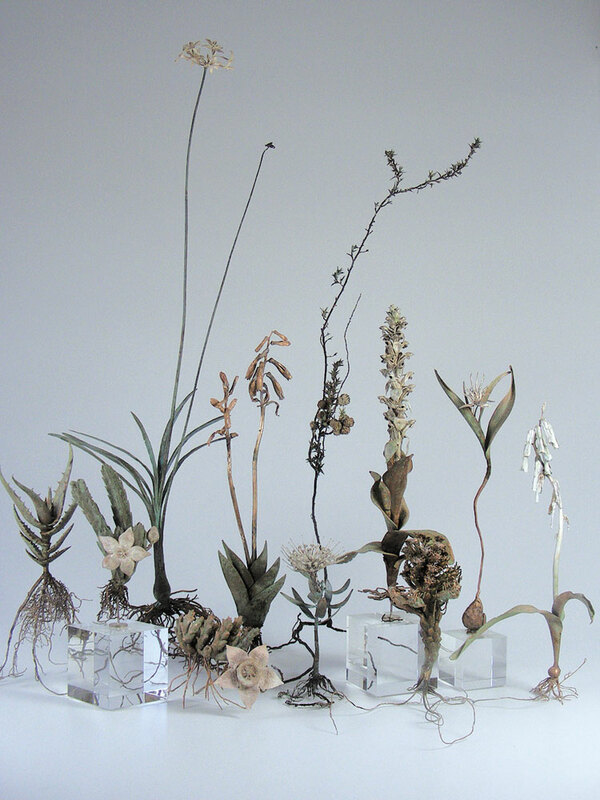 For 23 years she has devoted herself to the vessel as a form of sublime and articulate communication. Fascinated by light and inspired by the splendid landscape surrounding her studio and The Forge, a space for music recitals, exhibitions and happenings, she captures moments that resonate, glow and calm. 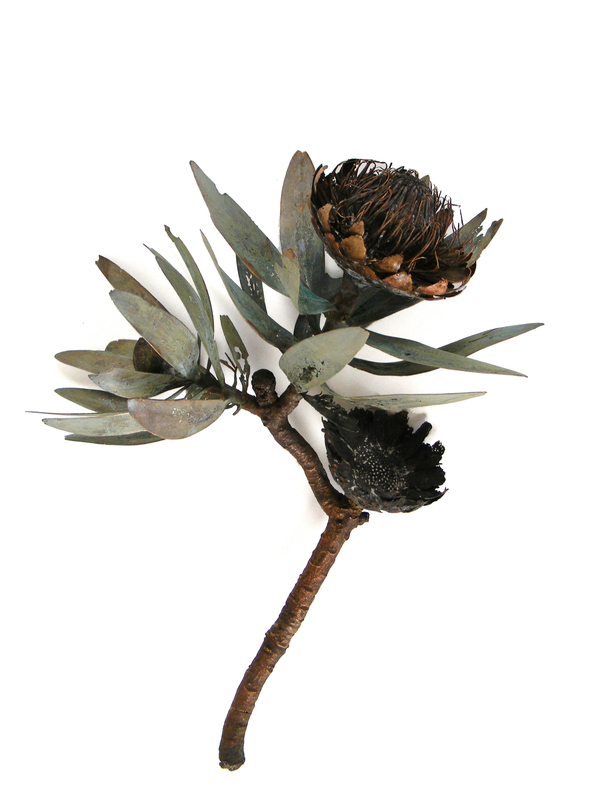 Another Kalk Bay local who contributes to the ceramics world is Christina Bryer. 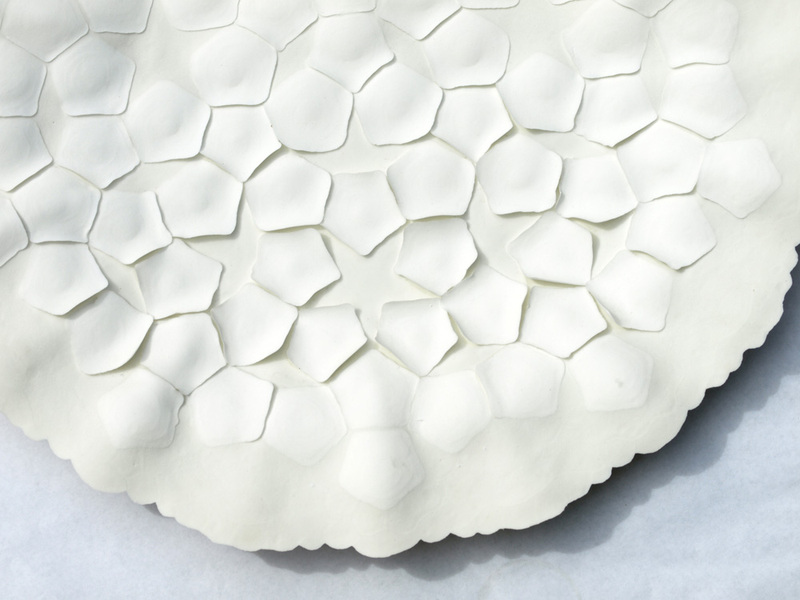 Her captivating porcelain mandalas offer the viewer a space for reprieve-a moment in which to rest within the perfect geometry from the noise of the world. Fraser H. Conlon is a partner in Amaridian, a Manhattan-based gallery specializing in contemporary art from Sub-Saharan Africa. 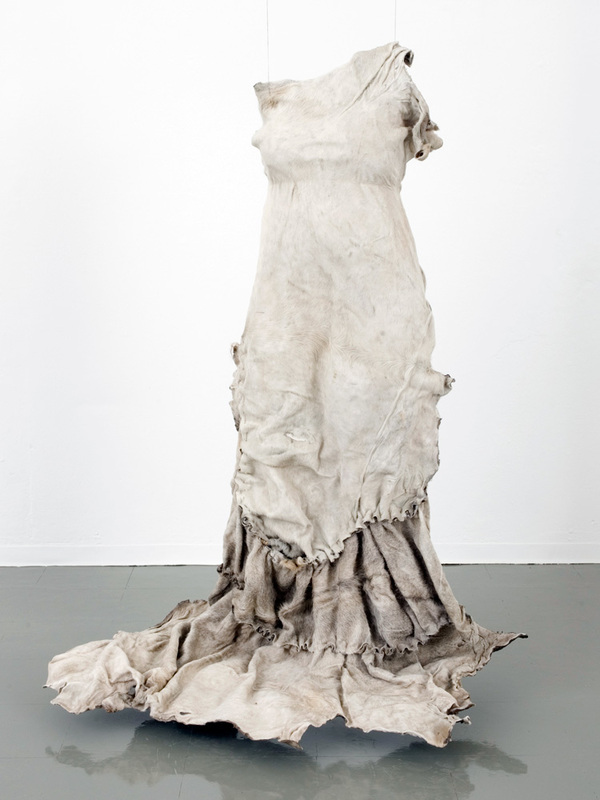 John Hodgkiss, Meditations on Solitude, 2009, cowhide, resin, polyester mesh, waxed cord, 61.4 x 47.2 x 23.6 in. Photo courtesy of Michael Stevenson, Cape Town. 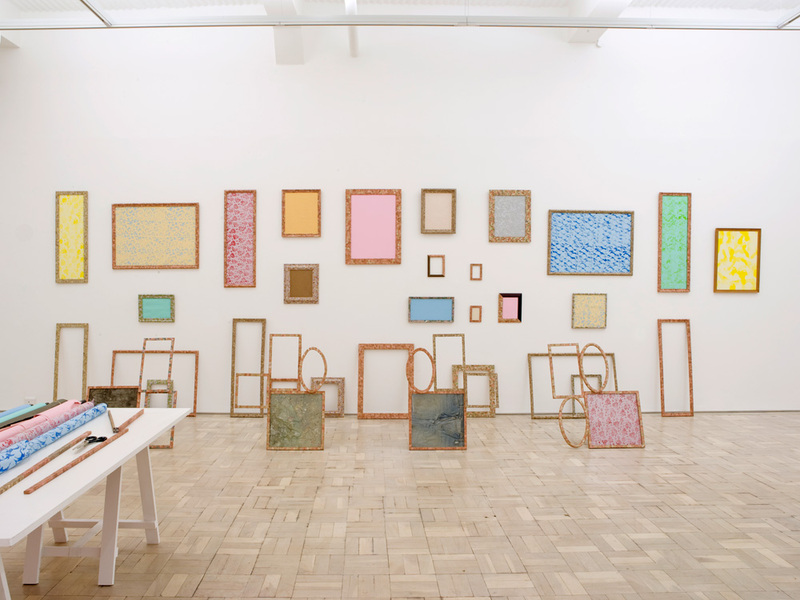 Meschac Gaba, Colours of Cotonou, 2007-2009, found objects, Beninese bank notes, wooden frames, glass installation, dimensions variable. One of the local women who participate in the cultural empowerment project Monkeybiz. 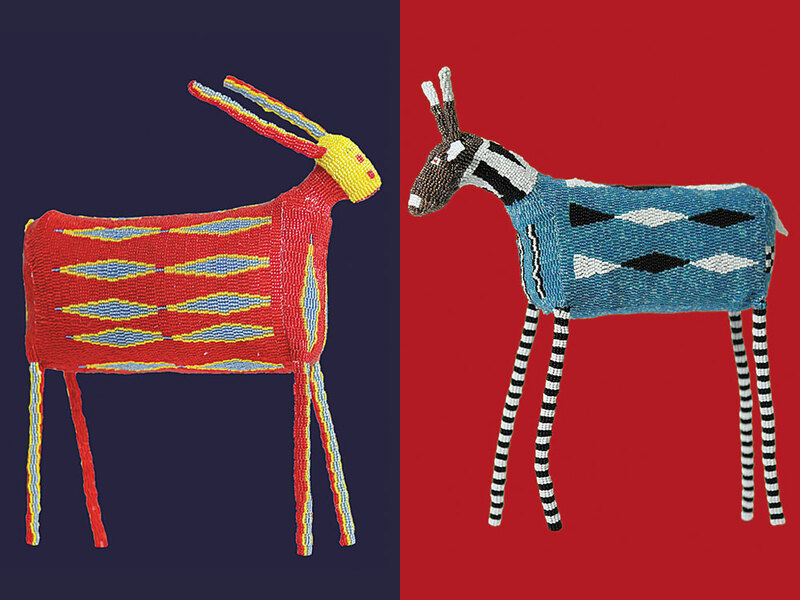 Left: Nokude Mpakati, Red and Blue Bokkie, wire, cotton and beads, 12.4 x 10.6 x 3.5 in. Right: Ncedile Ntloko, Blue Longhorn Bokki, wire, cotton, beads, 12.4 x 10.6 x 3.5 in. Streetwire collaboration, Designers: Michaela Howse and Elias Kula, Cow Masterpiece Looking Left, Nguni series, 2006, glass beads, copper wire, 11.8 x 23.8 x 6 in. 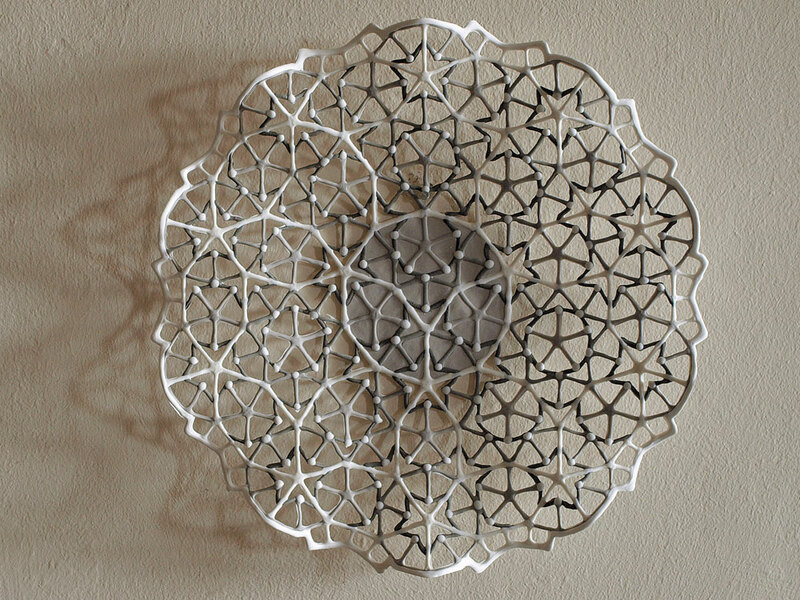 Christine Bryer, Mandala, 2009, porcelain, dia. 4.75 in. Christina Bryer, Mandala, detail, dia. 4.75 in. 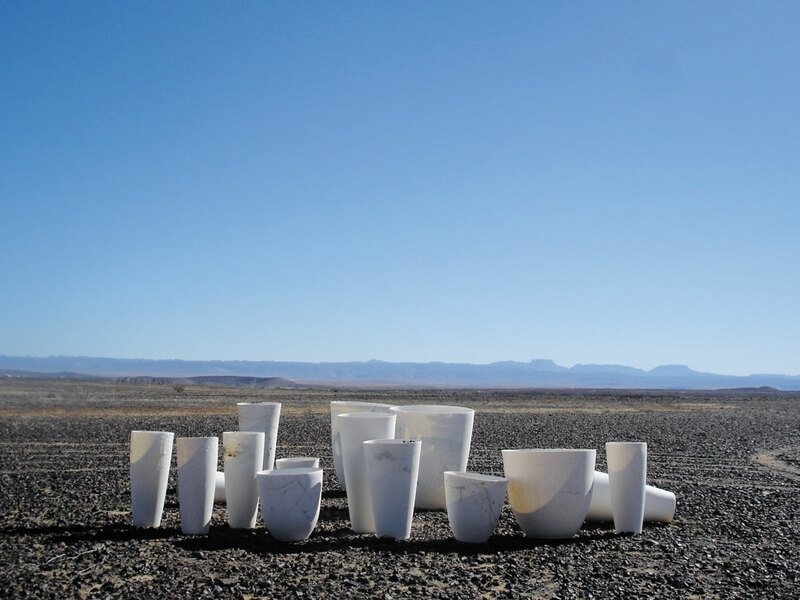 Katherine Glenday, Africa Burns, 2009, porcelain, dimensions variable. 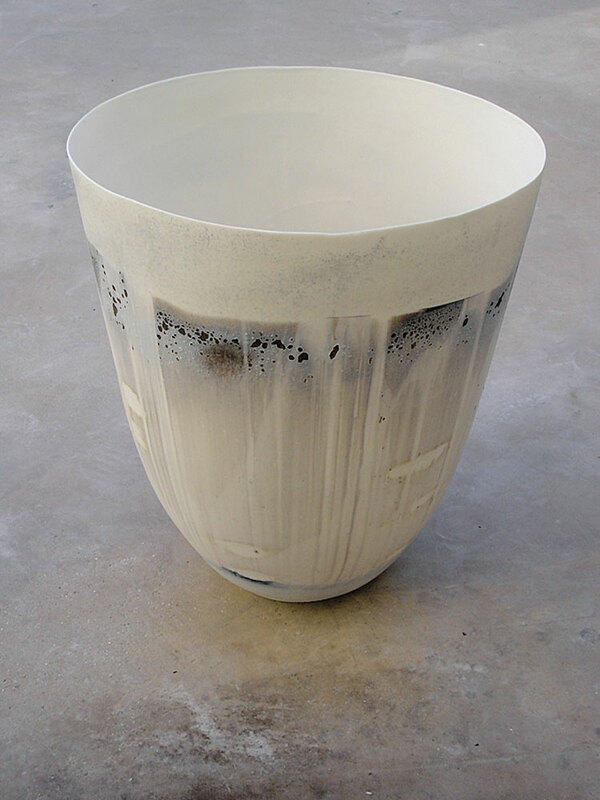 Katherine Glenday, Cape Point Vessel, 2009, porcelain, 13.75 x 11.8 in. 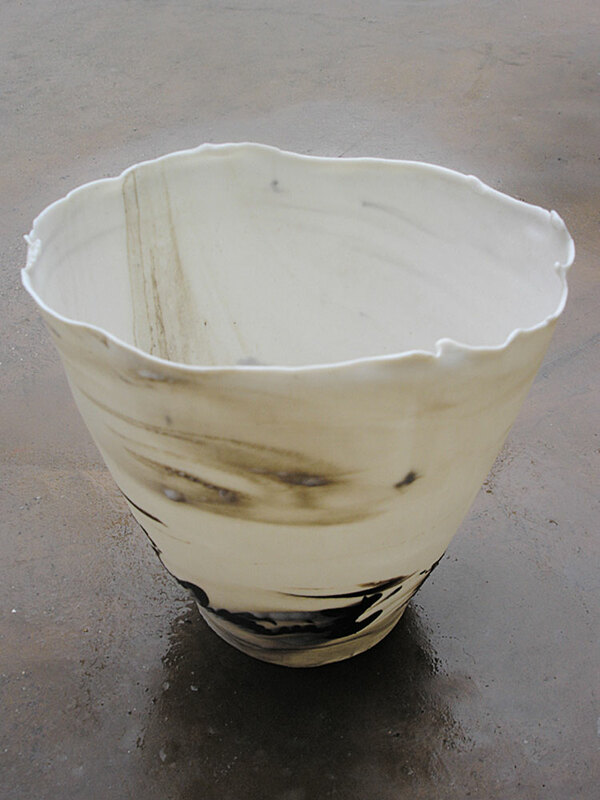 Katherine Glenday, Vessel, 2009, porcelain, 4.75 x 4.75 in. 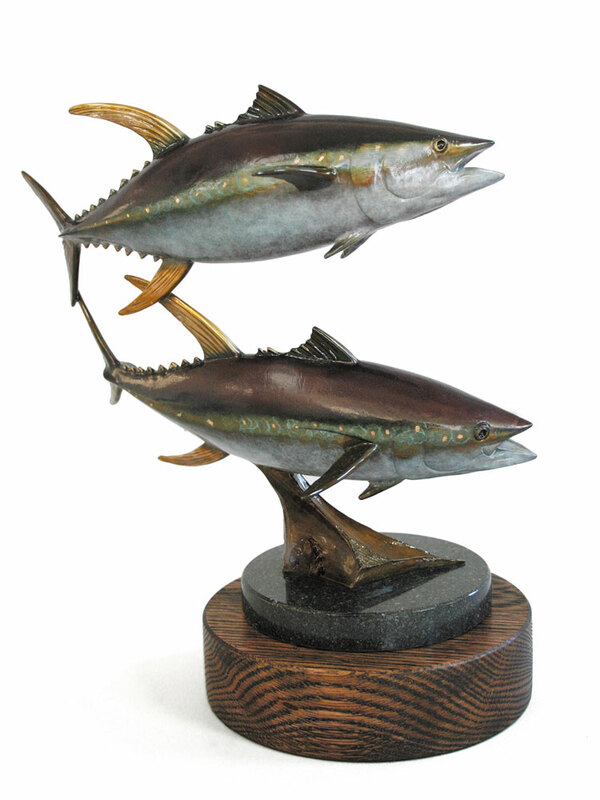 Chris Bladen, Yellowfin Duo, 2004, edition of 15, bronze, wood and granite base, 14 x 10 x 15 in. 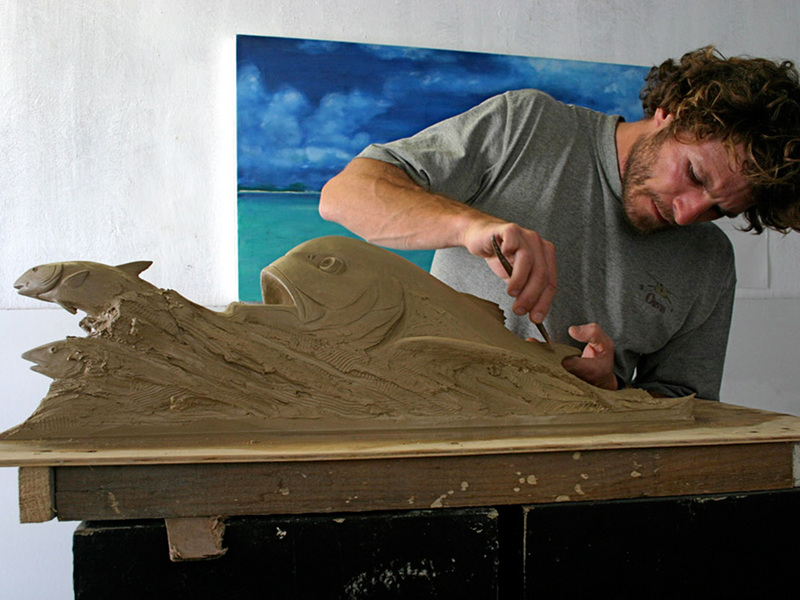 Chris Bladen at work on The Chase, 2008. edition of 12, 28 x 9 x 10 in. 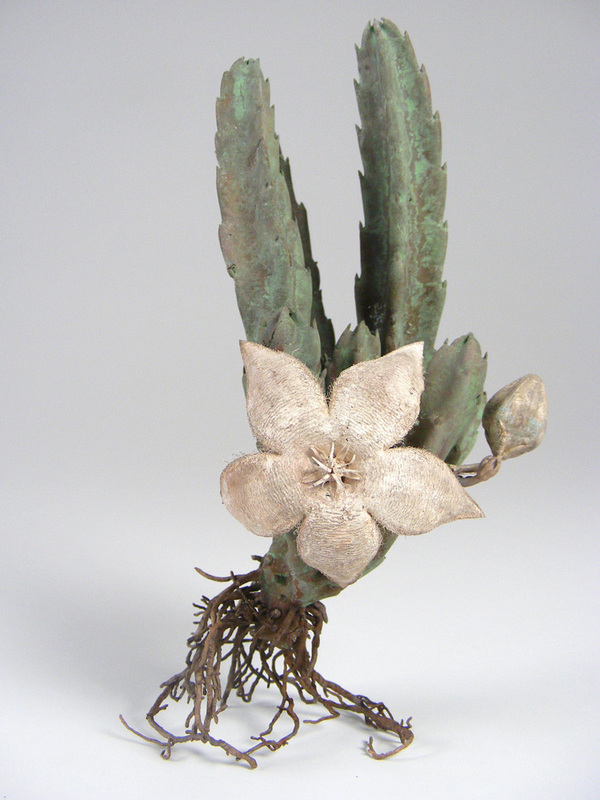 Nic Bladen, Stipelia grandiflora, 2009, bronze, silver, 6.3 in. 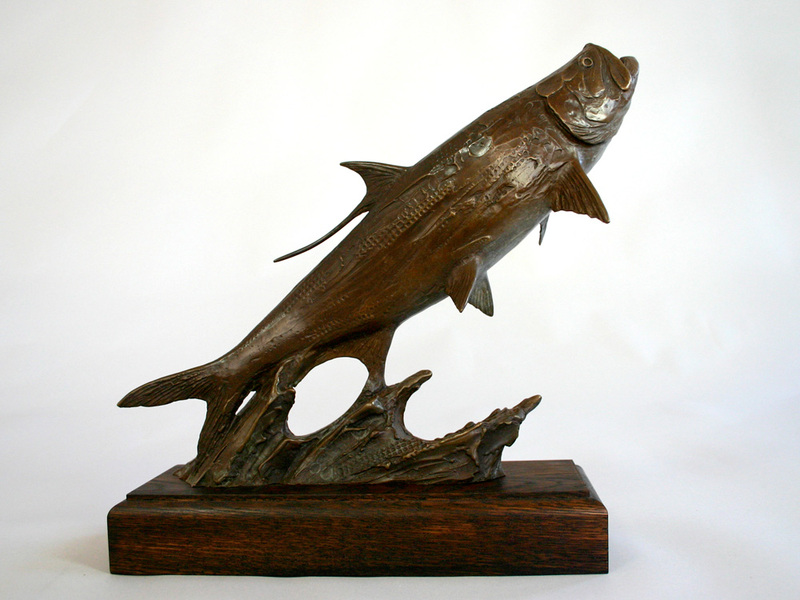 Chris Bladen, Tarpon Maquette, 2009, edition of 15, 13 x 5 x 14 in. Nic Bladen, new collection, 2009, bronze, silver, tallest 25.6 in. 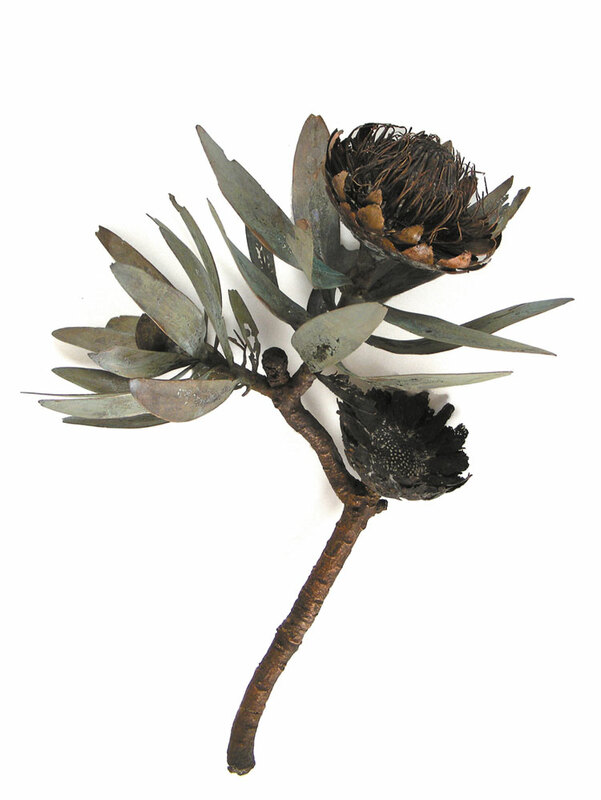 Nic Bladen, Protea caffra, 2009, bronze, 16.5 x 12.6 in. 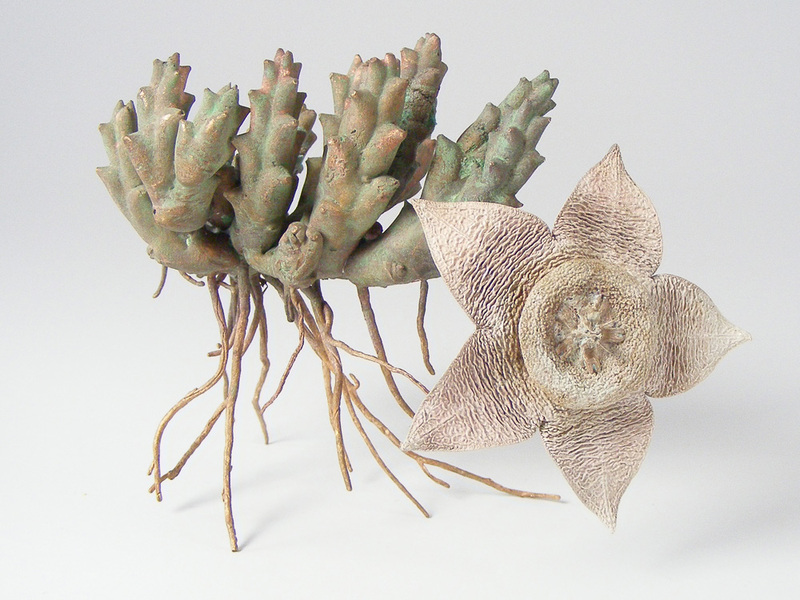 Nic Bladen, Orbea variegata, 2009, 3.5 x 5.9 in. Sabrina Gschwandtner finds a hotbed of new ideas. Meganne Fabrega finds Portsmouth, NH, a coastal city, to be a welcoming destination for craft, offering a sense of history and abundant cultural happenings. Since the fall of the wall and reunification, Berlin has become a magnet for craftspeople of every stripe, drawn by affordable live/work spaces and a progressive spirit. Jeweler Martina Windels accounts for the attraction. Tour the craft scene of this cosmopolitan city. Vienna, the city that gave rise to the Wiener Werkstätte more than a century ago, nurtures a thriving community of makers who consider their home a bastion for the applied arts.